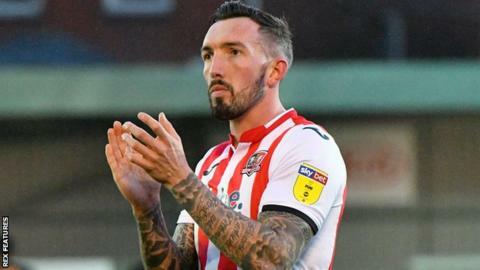 Exeter City forward Ryan Bowman feels there is no pressure on him to replace former top scorer Jayden Stockley. Bowman, 27, joined the Grecians soon after Stockley left for Preston North End in a deal worth £750,000 at the start of the January transfer window. Stockley scored 41 goals in a season-and-a-half at St James Park. "I had to fill his boots in a way, but I got told that there was no need to feel the pressure," former Torquay and Motherwell forward Bowman said. "I knew that it was going to be hard to get in this team, I knew it wasn't a case of coming in and starting straight away, although there's always pressure on being the front man." Bowman says he was attracted by the chance to link up with Exeter assistant manager Eric Kinder, who was a youth coach of Bowman's at Carlisle United. And although Bowman has yet to score since his move last month, he says he is confident he will start repaying with goals, having reached double figures in each of his last two full seasons in English football. "I'll keep working hard every day on the training pitch and when I get my chance in the first team I've got to take it with both hands. "I've always scored goals wherever I've been. The gaffer knows I can score goals, I've hit the bar, the keeper's made a great save in last couple of games so it's just getting that all-important first goal and then hopefully kick on from there."